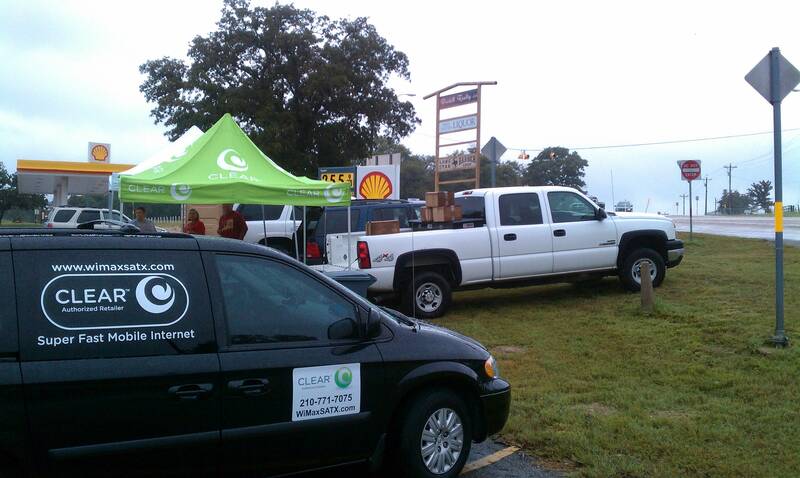 Over the weekend, we volunteered to help out at the 4th annual La Vernia Wild West Hammer Fest, a bicycle ride to raise funds for the La Vernia Historical Society, www.laverniawildwesthammerfest.com. La Vernia is a small town in Wilson County, about 20 miles southeast of San Antonio. 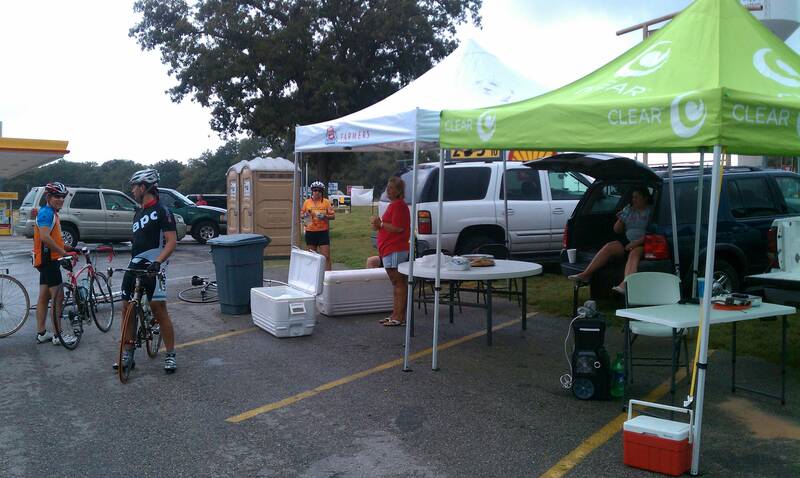 About a dozen hams from multiple clubs came together and helped out with this annual event in Wilson County. 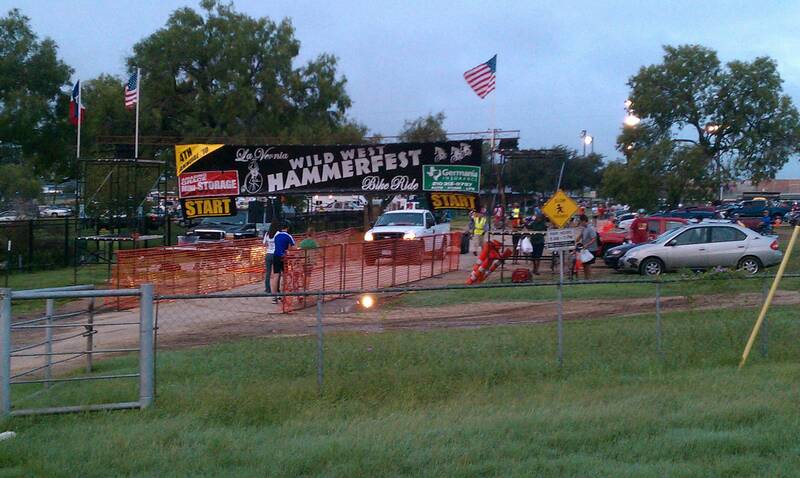 We covered the Start/Finish Line Net Control, 5 Break Points and 3 SAG vehicles. We could have used a few more hams for the other SAG’s, but this was a last minute request for help, and most of our usual volunteers had already made plans. We had three other hams lined up, but one got sick the night before, one got called into work by his boss for the weekend, and the third had to go clear up some damages caused by the storm that swept thru the area on Friday night, the night before the bicycle event. Charles & Barbara Manley were our Net Control Team for the event, and they had set up a canopy and radios at the Start/Finish line for their operations. But the rain and wind got to be to strong for that setup, so they shut down and relocated back inside their truck, using the mobile radio in it for the rest of the event. The event was scheduled to start at 8am, so all the hams were asked to be ready by 7am, except those going to Break Points #3, #4 and #5, since the riders wouldn’t be arriving so early. SAG hams got their radios and antennas installed in the proper vehicles, and Break Point Hams set up their own stations. SAG vehicles for this event, were personal vehicles with bicycle rack on the back, so the Hams were riding shotgun as navigator instead of being the driver. Hurricane Karl had just made landfall several hundred miles south of us, down in Mexico, so we didn’t really expect anything too severe to reach up into central Texas. The night before, a band of severe thunderstorms had drenched the area, up to two inches in 30 minutes in some parts of San Antonio were reported by hams. The National Weather Service had increased their prediction on the chance of thunderstorms for Saturday to 50%, mostly after 1pm. I set up my Ham Radio station at Break Point 5 around 9am, next to the tent from the local Farmers Insurance Agency, who was actually sponsoring the break point and buying all the snacks and bottled water for the riders. I used my green CLEAR 10×10 pop-up tent for shade and hopefully shelter if any rain showers popped up. Before I had finished getting set up, a resident walked over from the gas station to ask if he could get CLEAR Internet 4G service from me. Sorry, not today. La Vernia is not on the coverage map this year, but maybe next year. No sooner than we had set up our tent, did the rain start pouring. I climbed back in my van and used the mobile ham radio inside, while the rain poured outside. The wind was blowing it under the pop-up tents, and I didn’t want to risk setting up my radio gear with all the wet stuff blowing around. Something about electricity and water not being a good thing to combine, is what came to mind. 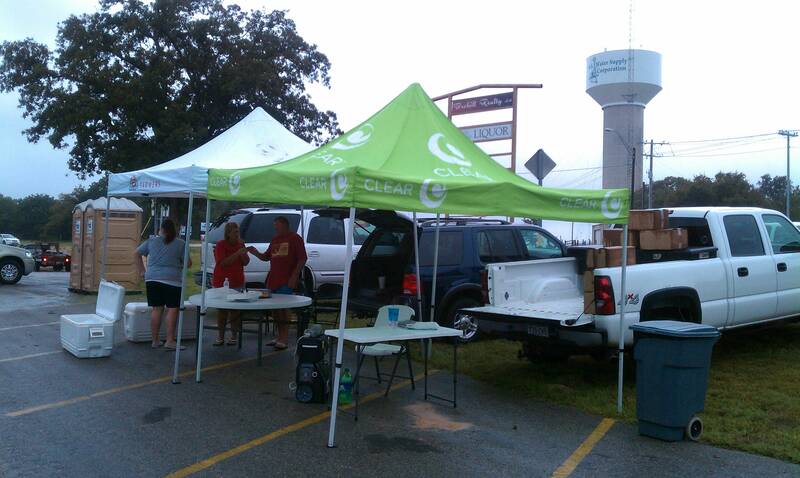 The band of rain went past us, and we resumed operations under the tent. I found out the hard way, that this tent was great for shade, lousy for protection from the rain. Apparently the fabric was NOT waterproof at all, and the top wasn’t taut enough to keep water from pooling in the corners where the fabric drooped down a bit. I spent much of my time going from corner to corner, pushing up the fabric so the water would run off the edges. I also put up a large DirecTV banner along the side toward the rain side, trying to reduce the amount of wind blown rain coming under the canopy and finding our notepad & radio equipment. Anyway, back to the bicycle ride. There were around 800 riders participating despite the threat of bad weather, with several routes to choose from, such as a family ride of 10 miles, a 34, 53 and 65 mile course. We had five break points along the course, plus seven SAG vehicles (cars to pick up riders who drop out or have mechanical problems between break points) cruising the various routes. We had ham radio operators in some, cell phone only contact with the others. 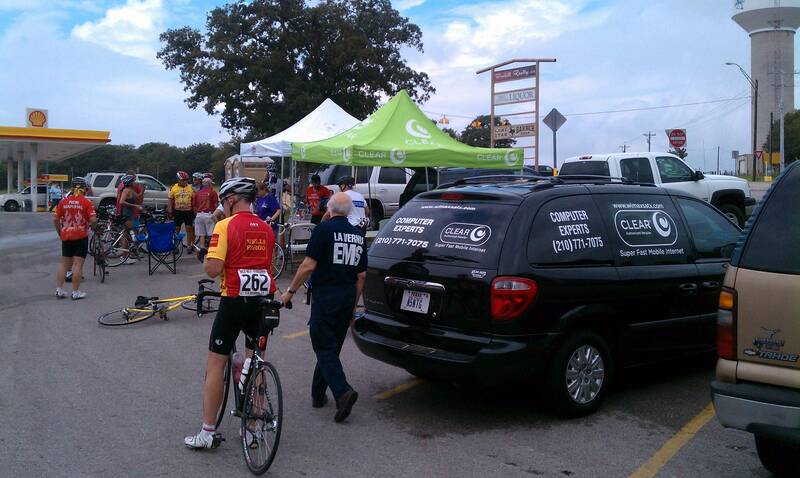 We had a few medical emergencies on the course, handled professionally by La Vernia EMS volunteers. One rider crashed on Highway 97, just south of 87, while the EMT was watching from his vehicle down the road. Just to bikes crashing into each other, no vehicles involved. The rider reportedly (we got this direct from the EMT witness) hit the pavement hard enough to crack his helment and skull, and before the EMT could arrive, a passing truck drove within inches of the downed rider’s head without seeing him. A few more inches closer and the truck would have run over him. We (the hams & La Vernia EMS) closed that section of the route long enough to summon the medical chopper to fly him back to San Antonio for intensive care. 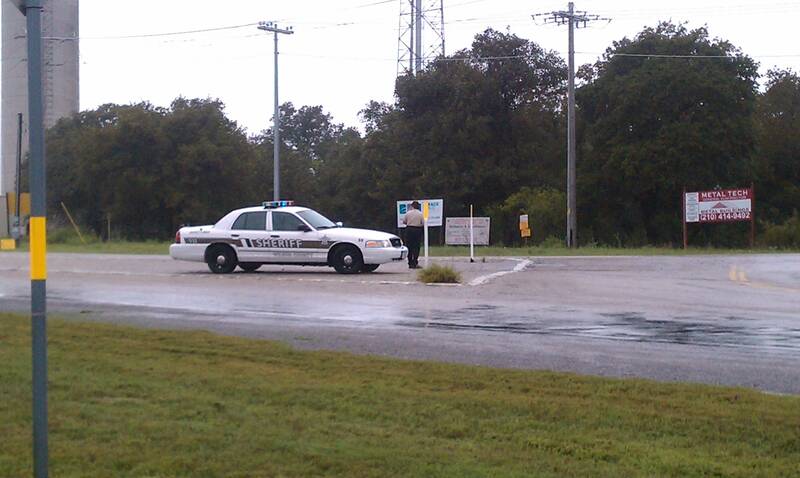 Other minor injuries were involved, mostly caused by wet roads. Around 1pm we started noticing on our Sprint EVO phone, using Radar Now (a free android market application that we had downloaded back in June when we first got our EVO phone), that another heavy band of thunderstorms was heading our way, and this time we wouldn’t be dodging it. All day long, thunderstorms had passed to the north and south of us, but not impacting our bicycle route with more than light rain. Now it was about to change. We called in to Net Control, advising them of the incoming storms and asking them to contact the event organizers with our warning. 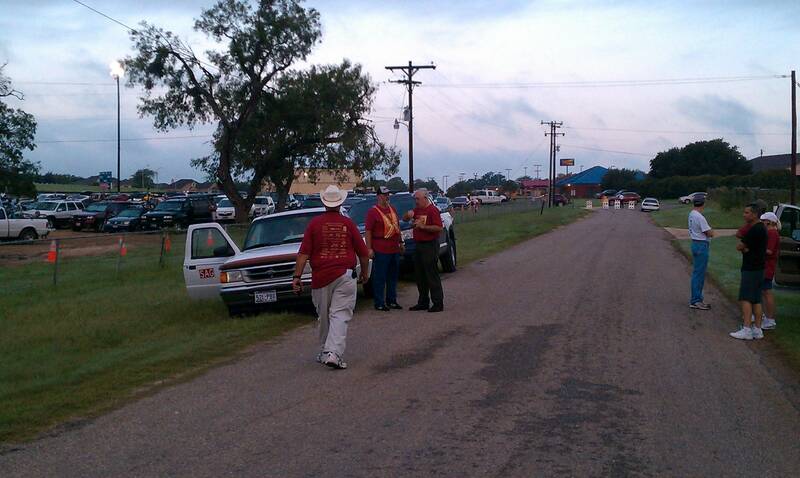 Around 1:15pm, we were talking with La Vernia EMS Medical 1 (guy in charge) who had stopped by our Break Point. 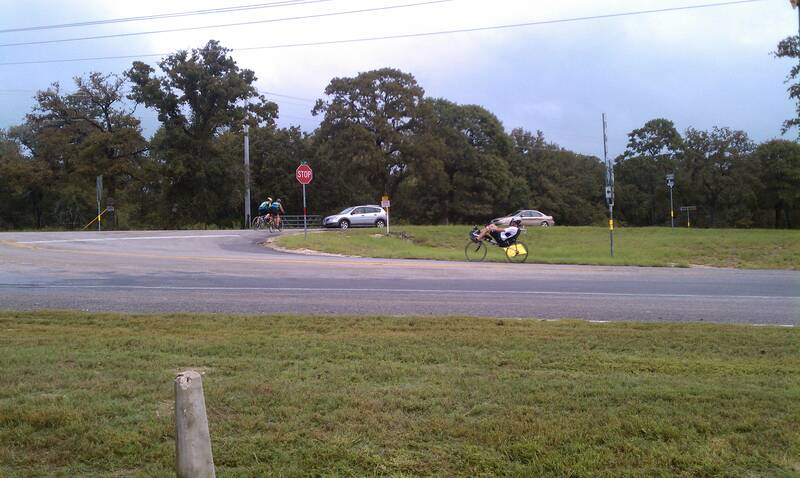 We were the last Break Point of the ride, only 7 miles from the finish line. He agreed with our assessment of the weather, consulted with the Wilson County Sherrif Officers, and advised that we really ought to close down the route completely and evacuate all the riders. We sent a text message direct to the person in charge of the event at 1:19pm, and at 1:25pm Net Control advised the route was closed, and that all SAG vehicles were needed at Break Point 5 to pick up riders, and sweep the course looking for riders who were still on the road. 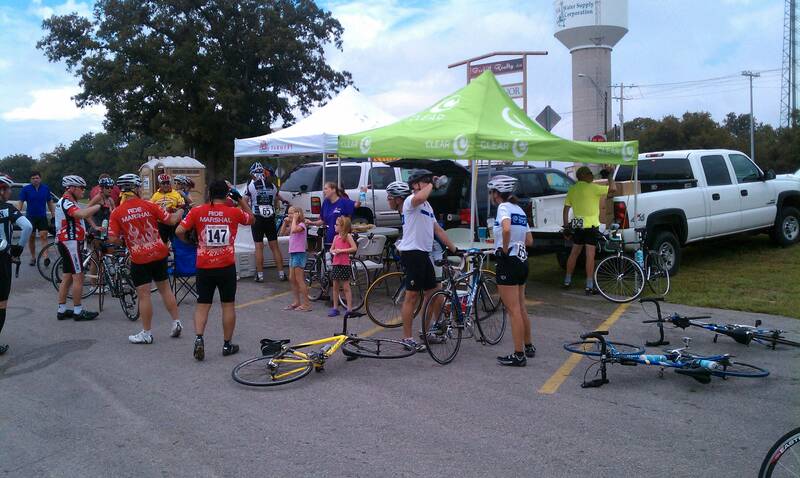 By 2pm, all riders were reported as off the route and had been safely returned to the finish line at the La Vernia City Park where they could shelter from the storm. By 2:15pm, we had our CLEAR pop-up tent packed and all our tables and gear stored back in our van, and we headed back east to San Antonio. The storm followed us, raining so hard that even driving only 40-50mph on a 70mph highway, was too fast to drive. Hams working this event, included Lee N5NTG, John N4NKN, Joe W4CTH, Ray AE5HN, Charlie W5BRC, Barbara KA5RLF, Eric WB5ZJQ, David W5QS, MaryAnn N5MYN, Curtis KE5HDL, Bob KA5AUW and joining us in-progress in the afternoon was Gary K5GST. 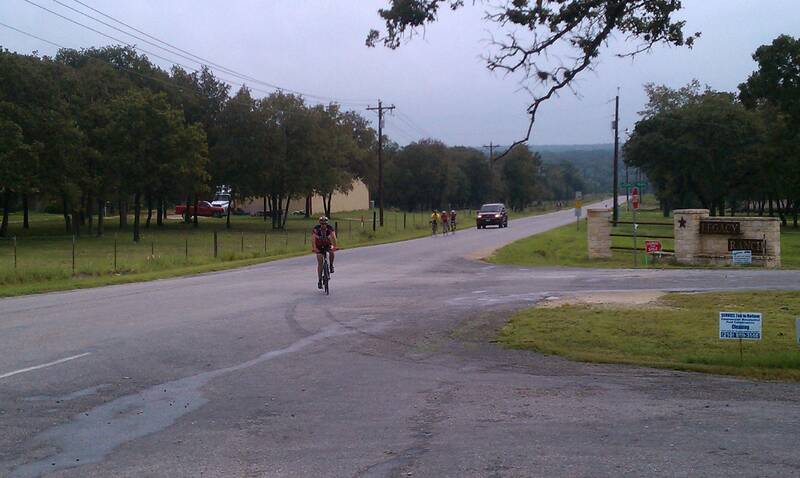 Neil WA5FSR was working as an EMT covering the portion of the route that passed thru Bexar County.